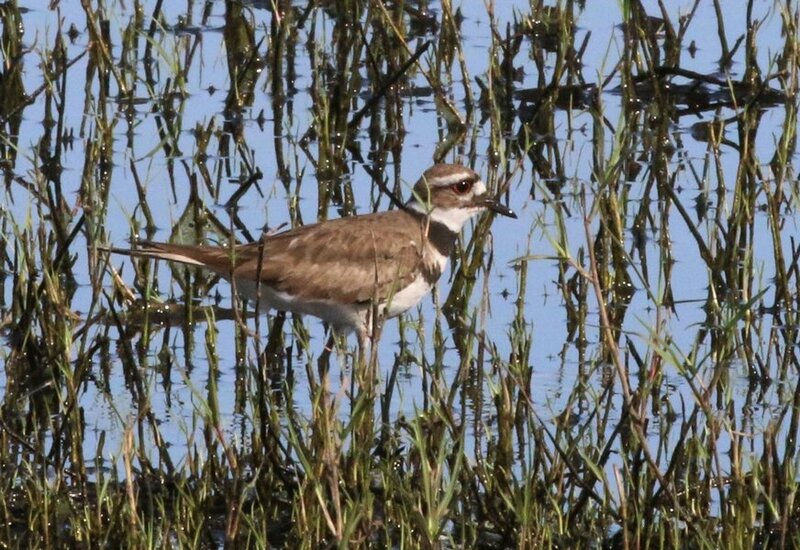 Now that the first day of spring has arrived, some of the Myakka residents can't help but break out in song. or sashaying through the woods scratching up any tidbits that might have been left behind. while some young'uns hide, hoping their long-winded distant uncle will share his glory days with someone else. Most, however, feel the excitement that spring brings. Love is in the air and you can never look too good. Competition is keen and figuring out what will win the heart of your soulmate is on many a mind. and plenty of time to welcome spring whether within a group or by oneself. The turkeys were out enjoying the day. Were you? Usually when I go to Myakka River State Park, I'm most interested in photographing the alligators, but since the birds seemed to be happily chirping away, I begin to look around to see where they might be nesting. It didn't take long to see they weren't nesting anywhere. 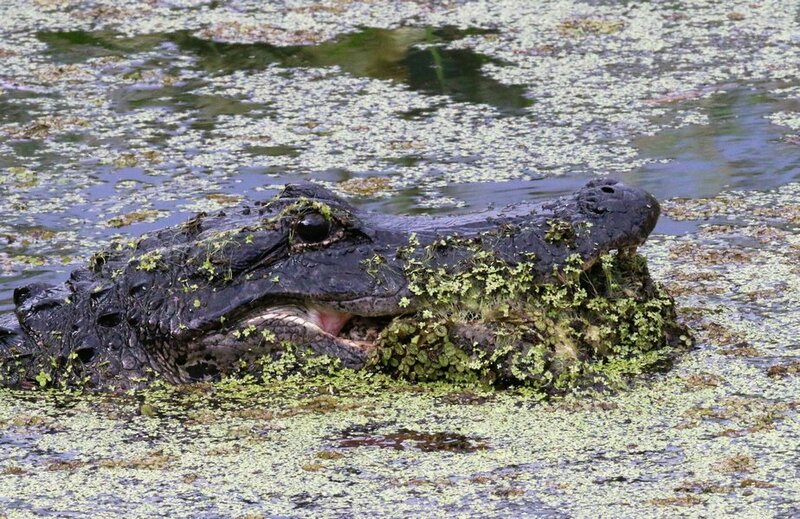 They were right where the alligators usually are, busily looking for food in the lake and wetland areas. Perhaps the birds wanted to remind me that the park was more than just alligators. The planet didn't just belong to the biggest and the strongest. There could be a place on this planet for all of us. As I watched one inquisitive bird listening to the sounds my camera was making, I wondered how tough it must be to come to a new land, .intent on making a better life for your loved ones and hoped that any voices they might hear would be voices of encouragement and understanding. Seeing the heron come upon the "curtain" of plants reminded me of all those obstacles that may be up ahead and hope for bridges to afford safe passage to those seeking a better life. 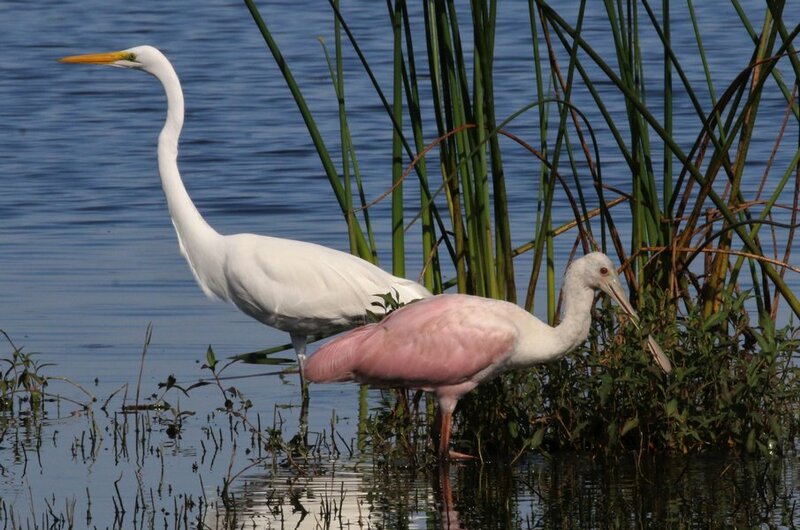 Seeing the spoonbill and the egret clustered together was a good reminder of how important it is to look out for one another if we all are to have a share in the bounties of the planet. 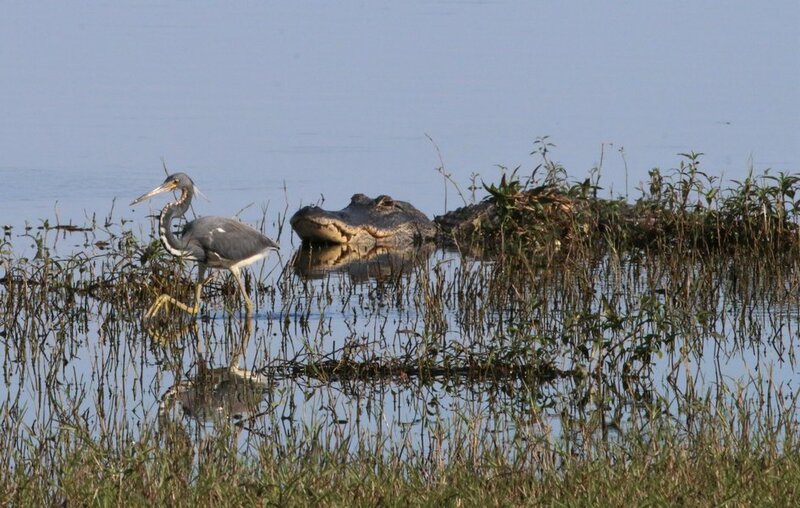 When I finally saw the alligator WITH the bird, it demonstrated once more that weak or strong, there can be a place for all, but it's always best to be vigilant to those who may have another agenda. 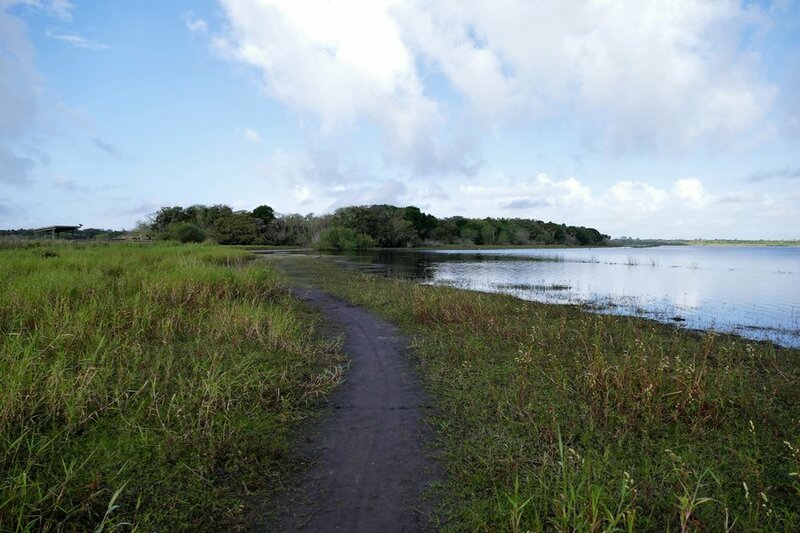 Going to Myakka River State Park is always a hit and miss as to what you might see. 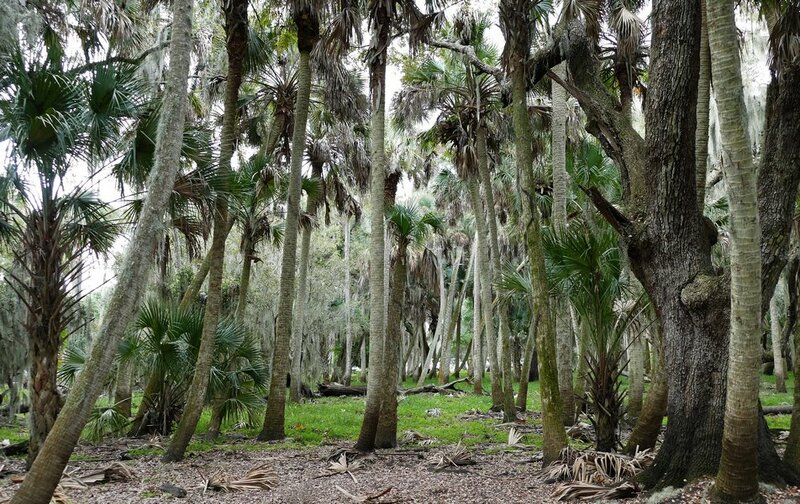 You might see gorgeous Prairie Irises which are toxic to humans and could cause a severe skin rash upon contact or you might see a wonderful meadow anchored by a gnarled old tree practicing some remarkable gymnastic moves among the palms. 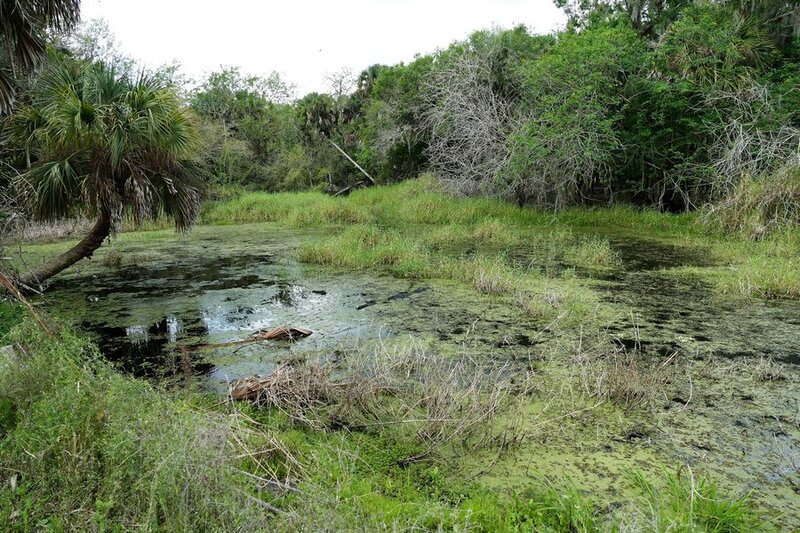 You'll surely see some alligators and no doubt a few may even go out of their way to greet you. 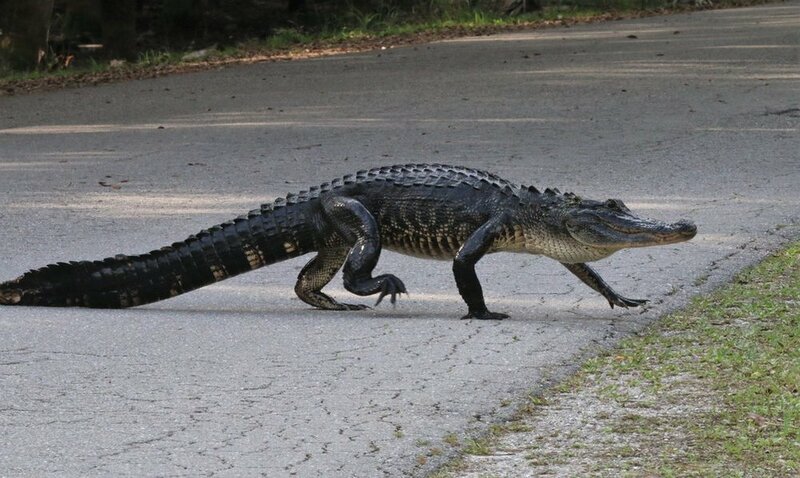 Should any of the locals happen to cross your path, please be courteous and give these folks the right-of-way. t won't take them long to cross the road, return to their habitat and once more be on their way to greener pastures. Who knows...if you're real nice, they might even share a dinner with you. I went to Myakka River State Park today to see if I'd be lucky enough to see the turkey strutting through the meadow but he was no where to be found. So I continued on to the weir. Generally I walk through the woods to get to the weir. Such remarkable beauty to see the oak trees bedecked with the Spanish moss or to even see the soaring palm trees stretching up to get their piece of the sun. Today I learned something new. There's another way to get to the weir. A path has been "carved" through the grasses and runs along the Upper Lake. It goes right to the base of the weir. A welcoming party of Vultures and Anhingas will even be there there to greet you and engage you in conversation should you so desire. 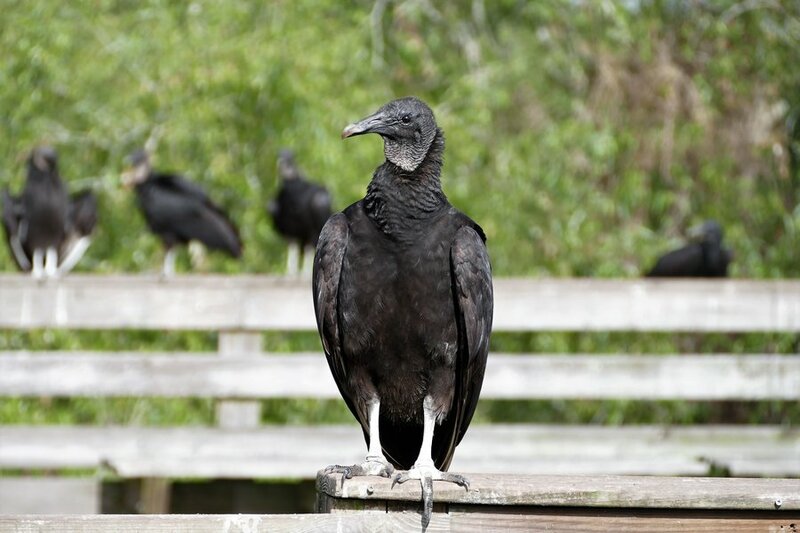 or a full-bodied shot, the vultures always seem ready and eager to please. 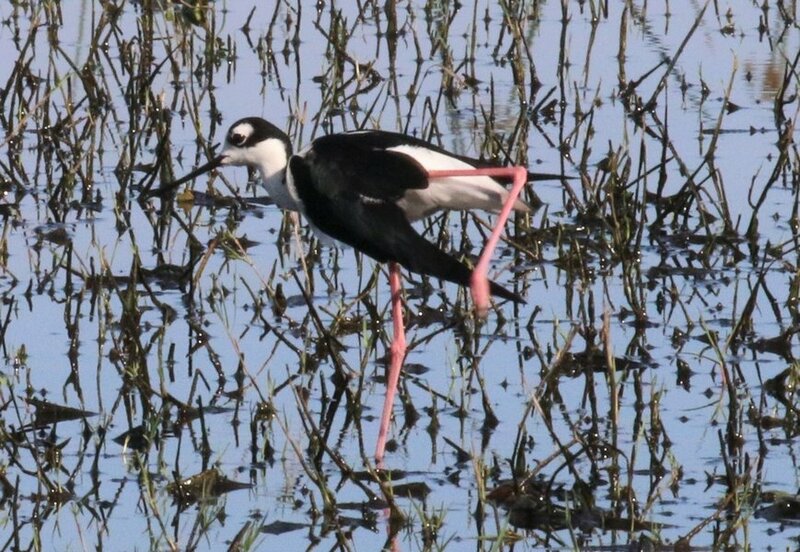 I'm not so sure about the wood storks. I love the wood storks and find them an interesting bird to photograph but I'm not so sure they're operating on "all fours" if they can mosey by an alligator, have the alligator make a half-hearted lunge for having had his sleep disturbed and the only reaction from the wood stork is a slight ruffling of his feathers. The wood stork apparently finds nothing formidable in an alligator. 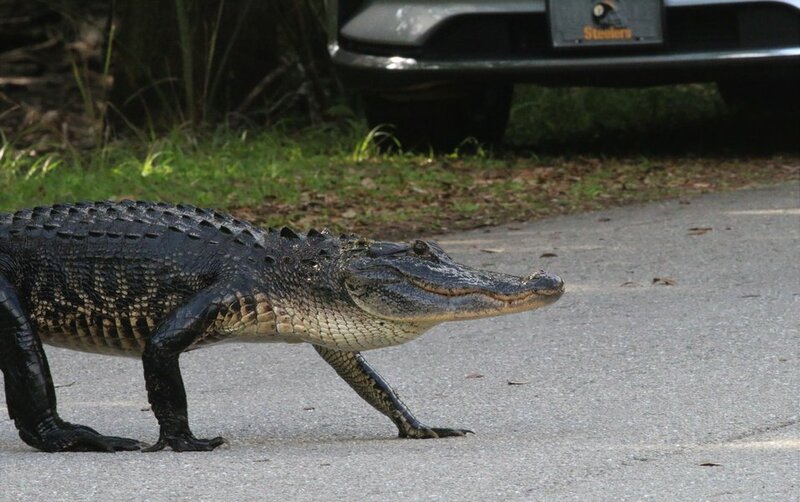 Since we're on the subject of birds, do you ever wonder why some people mistakenly believe that birds would be safer in a world without alligators? 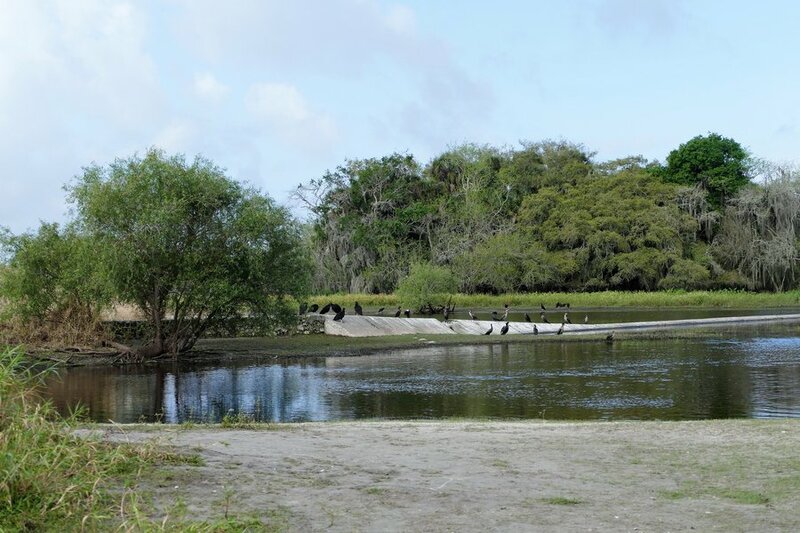 They must think that birds are at the mercy of the alligators who prey on them. Check out a close-up of this Great Blue Heron. In his world, no doubt his prey would be trembling at being in HIS sights. The intensity of the eyes...the sharpness of that beak...sure would hate to be on the receiving end of THAT power. Personally I think it's important to understand and accept there is room on this planet for all of us. When you start to point the finger at one species, there could be someone else pointing the finger at you. It's best to just move over and make room. Speaking of that, there is new life that is coming to the bridge. A Great Blue Heron has made a nest on one of the islands in the middle of the river and is hoping the world will soon make room for her little ones. 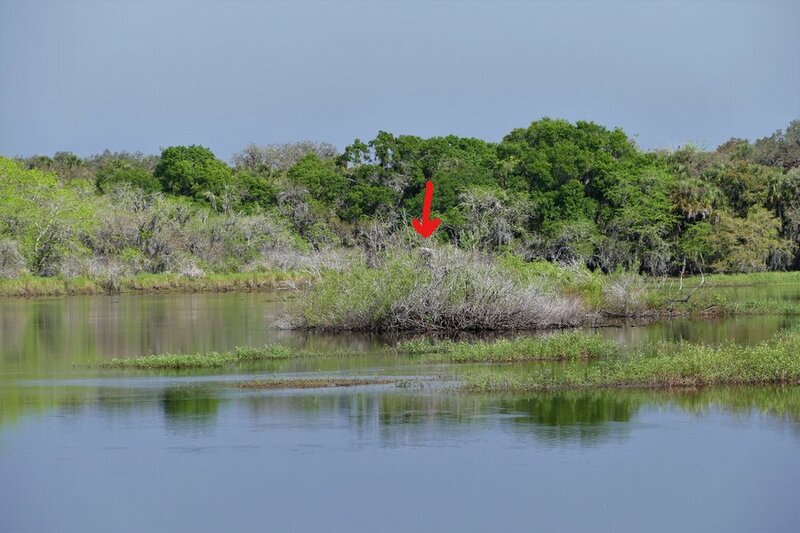 I didn't personally notice the nest was there, but one of the volunteers for Friends of Myakka was working at the bridge today and was talking about what visitors could see from the bridge. I thought she was about to tell me about the alligators or the limpkins but instead she surprised me with the news of the nest. It just so happened that Mom was on the nest when she pointed out its location but later, Mom lowered herself down into the nest. 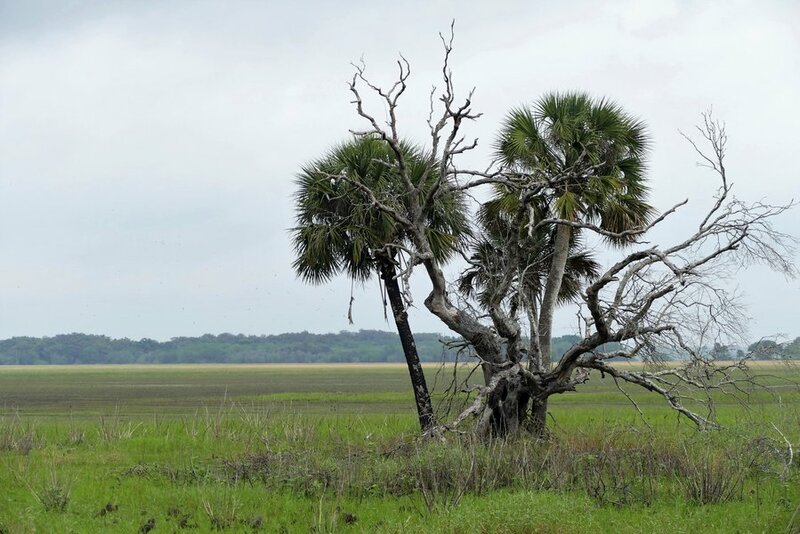 The next time you go to Myakka River State Park, bring your binoculars and check out the nest. Maybe you'll see Mom or maybe the eggs will be hatched and one of the little ones will be peeking up out of the nest but you won't see them without your binoculars. Look on the canopy side of the river and at least maybe you'll see bedraggled parents coming and going from the nest.